This is loosely based on Alexandre Dumas’s Le Prince des Voleurs (1872), itself loosely based on Pierce Egan’s Robin Hood (1840), a story from which can be found in Your Editor’s Big Book of Swashbuckling Adventure. It was adapted for the screen by Charles H. Schneer, better known later as Ray Harryhausen’s frequent producer and partner; this is Schneer’s only screenwriting credit. 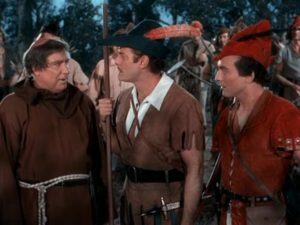 In Sherwood Forest, which has never looked more like southern California, Robin Hood (Jon Hall) saves a traveling noble couple from assassination by an unknown archer. Robin takes them to his camp, where the nobleman reveals that he’s one of the retainers of King Richard, still in France; the woman is his sister, whose name is Lady Marian. Her brother has come to claim the hand of the daughter of the Lord of Nottingham—but the lord has reneged on his promise and intends to marry her to Prince John’s nephew. Suddenly the noble nephew’s soldiers stage a surprise attack. And that’s all just in the first ten minutes! Fortunately, Robin has another hour in which to get things sorted out. This is another one of those cowboy Robin Hood pictures, where everyone rides horses —except for Friar Tuck, who rides a cute little donkey to good comic effect. The swordplay is ludicrous, the knife-fighting is worse—everybody does that stupid-looking overhand stab—but the archery is pretty good, probably because all the guards and bandits have played Indians in low-budget Westerns. But the pole-arm work with those sad halberds—by my halidome, what an embarrassment! All in all, meh: this is one for Robin Hood completists only.